Can a $70 lens (brand new) deliver decent results on a Micro Four Thirds camera? VSL investigates. 7Artisans 25mm f1.8 lens for Sony E series or M4:3. I was buying some cheap bits and pieces for my Godox AD200 flash at Amazon.com a day or two ago and, after getting my pressing flash accessory business squared away, I started doing a little good natured browsing. I was looking to see all the different lenses that are available for my Panasonic cameras. I was especially interested in a fairly fast, normal lens which, on the GH5, would be a 25mm. I was surprised to find a number of choices, including: the (most coveted!!!) Olympus 25mm f1.2 (with 19 elements, no less) as well as the 25mm f1.8 Olympus and it's counterpart, the Panasonic 25mm f1.7. 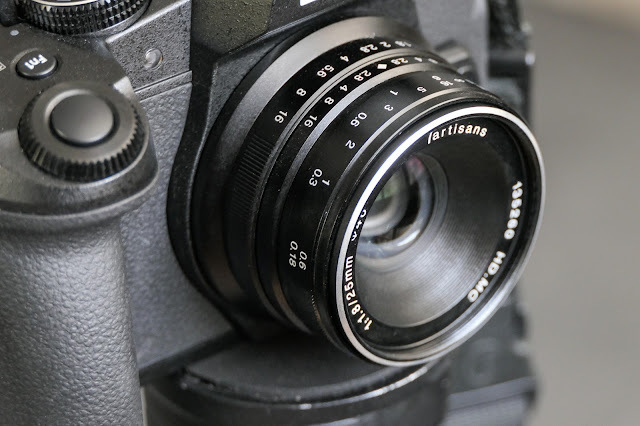 The lens I wasn't expecting to find was a new product by a company called, 7Artisans. The lens is a 25mm f1.8 lens that is fully manual in its operation with any of the Olympus or Panasonic cameras. The thing that caught my eye was the price; it was a mild and rational total of $70.